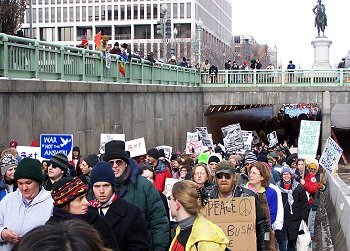 Why Isn’t My Generation Protesting the War? Many a political conversation with my liberal father has turned into a discussion about my generation’s failure to take a stand against George Bush and the Iraq war. My father, still a hippie at heart, will start in: “Back in the day when we used to stand up for what we believed in….” I’ll roll my eyes, partly humiliated by my father’s trip down memory lane, partly embarrassed for how we’ve disappointed him. Even though we’re living in a time of scandal, secrecy and incompetence, my generation is apathetic and sedentary. We don’t care, because all of this is easy for us to ignore. Because of our all-volunteer army, we know we won’t wake up tomorrow to be drafted. Because we are fighting on foreign soil, we can walk safely on our streets without fear of bombs being detonated or gunshots erupting. And so we remain blissfully ignorant of the war, and disengaged from war’s ramifications. Although my parents have long since cut their hair and tossed their bellbottoms, they still march in protests and go to peace rallies. They still speak their minds, because they believe that the people have power. But we’re also living in a different era. Our economy is not as stable as it was during Vietnam, so it’s harder for people to give up their corporate jobs to take a stand for what they believe in. Plus, my Internet-reliant generation is unaccustomed to physically getting up and going outside to do things. A few Internet sites speak out against the war, but none has generated much heat. We need to find a way to motivate our generation to speak its voice. And whatever our tactics, we need to get up and take them. I blame it on the lack of a draft. I blame it on the confusion over Iraq policy. I blame it on the economy. But mostly, I blame it on us. The truth is, we are selfish. We also feel impotent: we seem sure we can’t change anything. When did we stop believing in the importance and the power of speaking our minds? When did we stop questioning, and start accepting everything that came our way? We have entered a dangerous mindset, and have given the president too much power, over people unwilling to stand up against him. Nearly 3,000 Americans have died unnecessarily. Hundreds of thousands of Iraqis and civilians have died in a war that we should not be fighting. If we don’t take a stand, who will? Jennifer Kramer is a journalism major at New York University, and has an associate's degree in fashion merchandising. This article was first published on NYU Livewire, a biweekly service supplying newspapers and magazines with feature stories about and for young people in college and their twenties.